At the tender age of 21, I left my mother’s home and went off into the world, moving 250 miles away. As a graduate moving from temporary job to temporary job, the budget for kitting out my new pad was limited. I heard Ikea was affordable and stylish so off I went to have a look. I wasn’t planning on buying, but it’s simple, contemporary Swedish good looks and affordable price tag was too much for me to resist. I spent hours roaming around the showrooms. Knowing I could only look and not touch increased the excitement. I still remember the first time I worked up a sweat in the warehouse section, grunting and panting as I lifted the flat packs off the shelves, placing them gently on the trolley. I remember handing over my credit card without a care in the world. I remember the hours of assembling, and the proud feeling of knowing ‘I did that’. Me and Ikea, no one could touch us. As the years went by my love for Ikea started to diminish. Walking around the showrooms became frustrating and dull, the furniture was boring and repetitive with no individuality and the price tags were cheap like the quality. I had a pair of bedside cabinets and chest of drawers that followed me around for years. They had stayed with me through my break up with my long term boyfriend and were the only pieces of furniture I left my first apartment with. They stayed with my through the bad times so I couldn’t possibly part with them once I had found my own apartment two years later. On moving day, I unpacked them from the back of a van and placed them in my new bedroom with my new white, fresh looking furniture. My apartment was clean and free from arguments about the dishes and whose turn it was to buy toilet rolls. They looked tired, worn out and had no passion or zest for life. I couldn’t bear to buy a new set (mostly because my bank balance wouldn’t allow me) so I decided to get the spark between us back. I painted them white to give them a brighter, fresher look but they still looked like generic pieces of Ikea furniture. They sat there for months being used only as storage. I was fed up but couldn’t give up on them. Then, I had an idea. I could wallpaper them! Surely, this would make them fun again and bring some passion back into the bedroom. If you want to change the colour of your furniture you need to sand and sand and then sand again. Getting your hands on an electric sander really helps, but you can do it using regular sand paper too. Prime the furniture using a spray primer. It’s much easier and quicker than painting. Let it dry for about 45 minutes before adding the paint. Pick a good quality paint especially for furniture. I used Dulux satin finish brilliant white. With the primer, I only had to apply two coats of paint. Let the paint dry over night before you wallpaper. As you would with wallpapering a wall, you need to make sure the patterns match up so get out your tape measure and scissors. Cut out all your bits first and make sure they line up before you stick anything down. Stick the wallpaper with a strong adhesive spray. You have a few seconds to move and line up the wallpaper before it dries so don’t panic. Leave it to dry for as long as possible. I put the drawers back together after a few hours but it’s probably best to leave it overnight. Buy handles or knobs to really add your own style. I bought a set of faux crystal and gold knobs from ebay at a really affordable price. Enjoy your new and improved furniture. The process wasn’t easy, and at times I felt like giving up, but now I am happier than ever. I have been asked whether the paint chips or the wallpaper starts to come away at the sides. The answer is ‘I don’t know, but at the moment I am happy with them’. I am still in the honeymoon phase and love walking into my bedroom and seeing my beautiful, unique pieces of furniture. I hope they stand the test of time, I really do. One thing is for sure, I won’t give up on Ikea that easily. 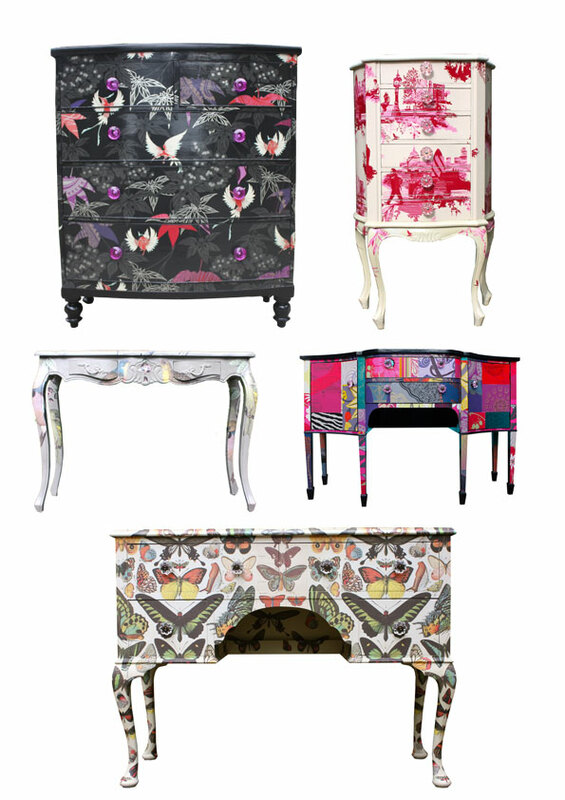 Get some inspiration from these beautiful pieces by British artisan Bryonie Porter.